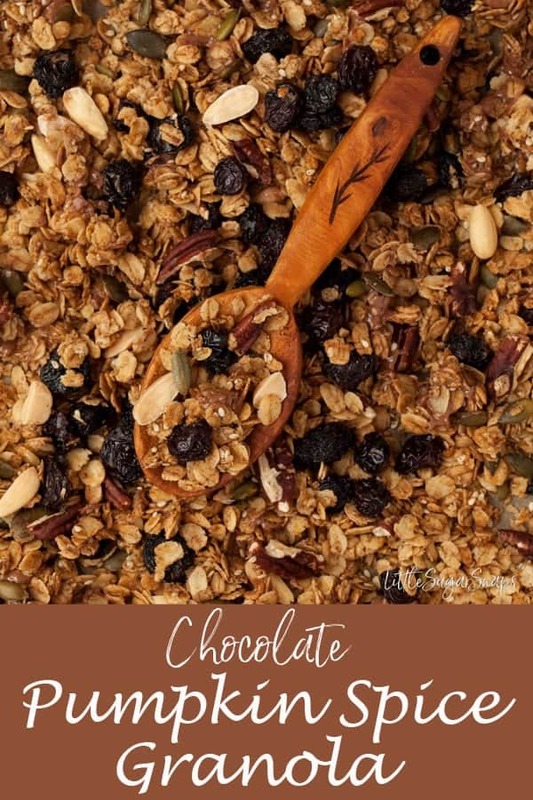 Pumpkin spice, nuts, chocolate and salt combine to create a luxurious and irresistible Chocolate Pumpkin Spice Granola. This is one decadent breakfast. Normally I go all out to cut the amount of sugar from my family’s breakfast options. I have a deep loathing for the so-called healthy cereals that contain so much sugar they are anything but wholesome. However, once a week, I relent. I close my eyes, hold my breath and let my kids have a cereal that they really want. 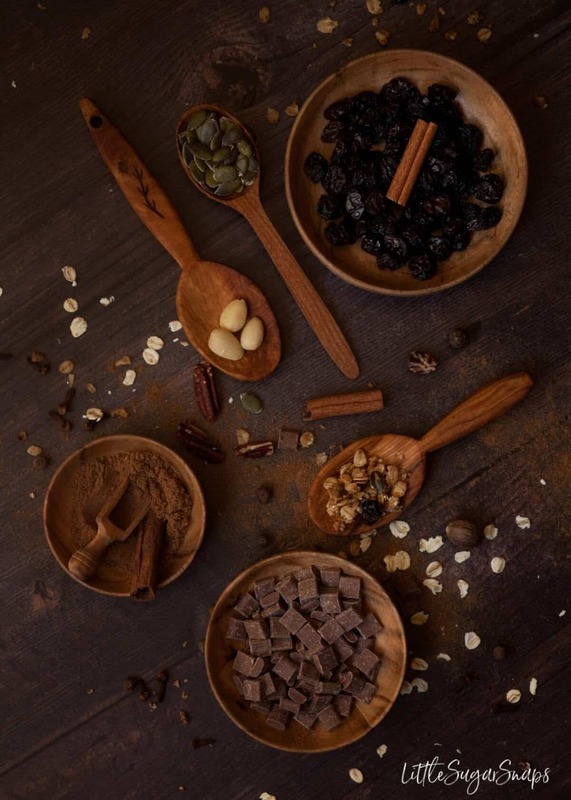 Without naming brands, they usually wind up picking a sugar-laden variety that is either nutty, chocolatey or cinnamon spiced. However, last weekend, it was my homemade granola that, without hesitation, won favour. Interestingly, it just so happens that the granola in question covered all these popular flavour bases. You see, my latest granola wheeze is not my typical style. This Chocolate Pumpkin Spice Granola is the opposite of healthy. But it’s oh-so-good and that is why I’ve made an exception to my health-minded rule and added it to my extensive catalogue of granola recipes. I admit it is the odd one out. The rest on the list all do their utmost to be nutritious. But this beauty is too good not to enjoy every once in a while. Chocolate Pumpkin Spice Granola really does embrace autumn… and the US obsession that is pumpkin spice. 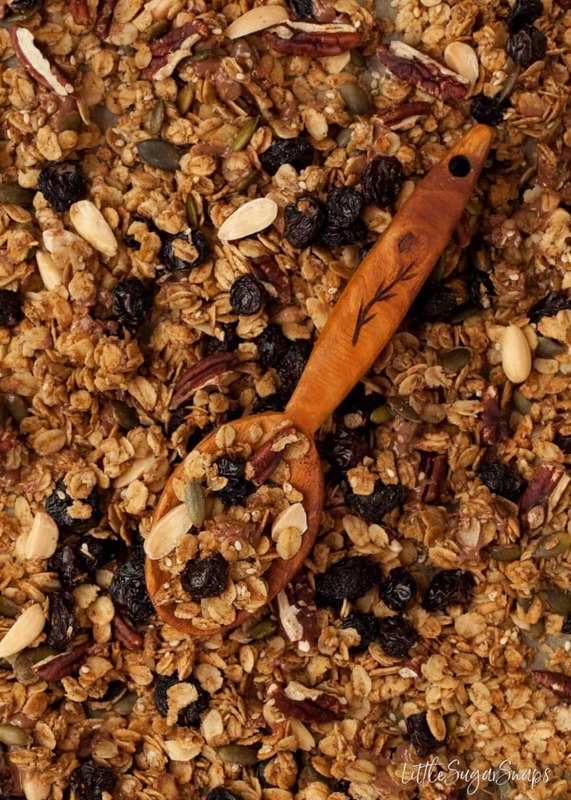 Needless to say, this granola is full of seasonal spices, along with maple syrup & pecan nuts. And all of these flavours are enhanced by the addition of chocolate and salt. Yes, salt. Somehow the salt seems to pair effortlessly with the chocolate, nuts and spice to create a rich, fully-flavoured breakfast treat. And I do stress the word treat. This granola contains more maple syrup than any other granola recipe I have created. It also contains chocolate chips and a generous blast of salt. 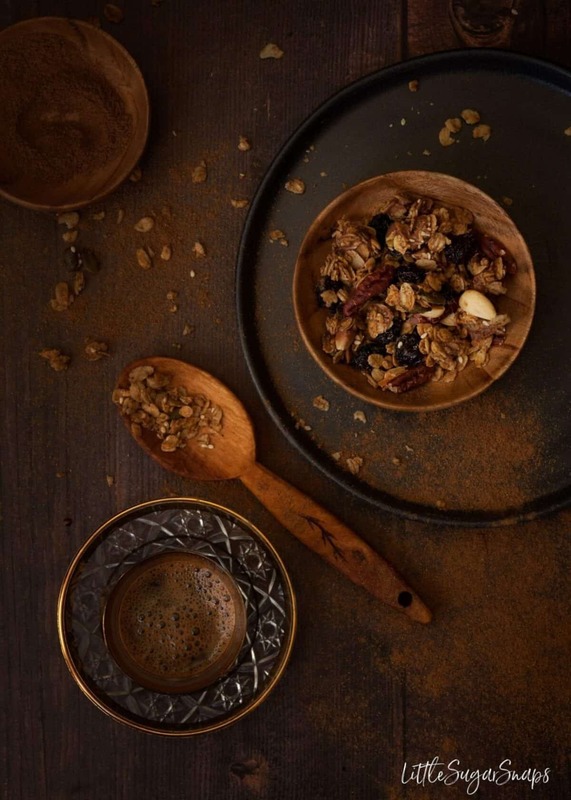 So although I would not advise tucking into a bowlful of this Chocolate Pumpkin Spice Granola every day of the week, an occasional indulgence won’t do you any harm. Warning: this is the kind of granola that is hard to resist. Don’t blame me if a batch doesn’t last long. 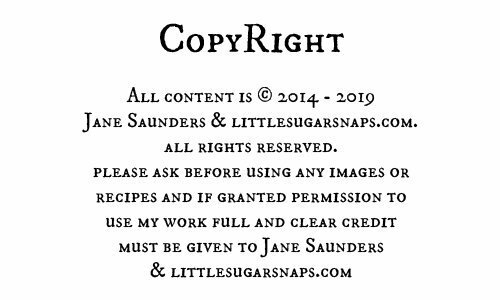 I’ve used my own pumpkin spice in this recipe, which blends cinnamon, ginger, nutmeg, cloves and a little mace. Feel free to use your own pumpkin spice blend, or alternatively try adding chai spice instead. 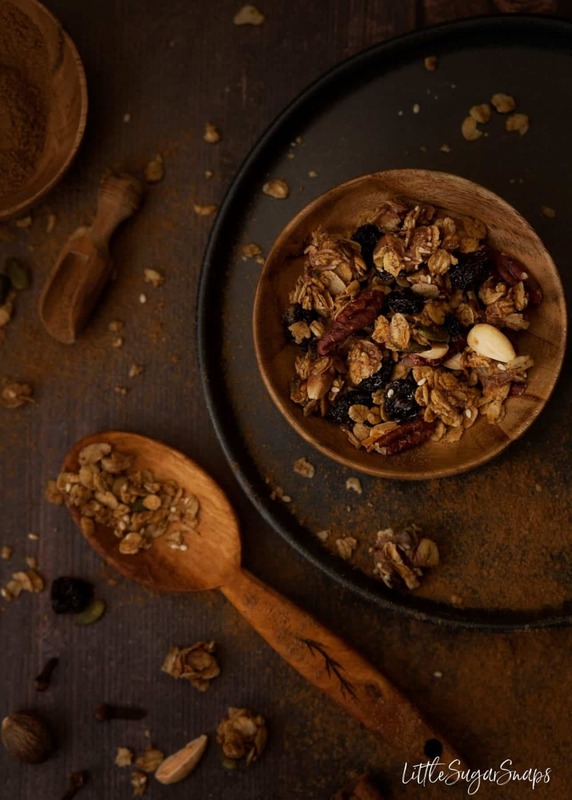 As far as granola recipes go, this Chocolate Pumpkin Spice Granola is pretty straightforward. My one tip would be to mix the granola very briefly and gently once the chocolate chips have been added. The chocolate needs to melt slightly and spread just a little. The aim is not to mix it in completely. Stirring just briefly allows the chocolate to blend sufficiently to flavour every mouthful and create clumps of sweetly spiced, salty, oaty and nutty granola joy (sigh). A few of the chunks may end up large, but these can be split once cooled. My favourite way to serve healthy granola is with rich & creamy full fat milk and, let me tell you, this is also the best way to serve this decadent Chocolate Pumpkin Spice Granola. If you are going to splurge on breakfast, I say: don’t hold back – go the whole hog. Every so often it’s good for the soul. This is one decadent breakfast. 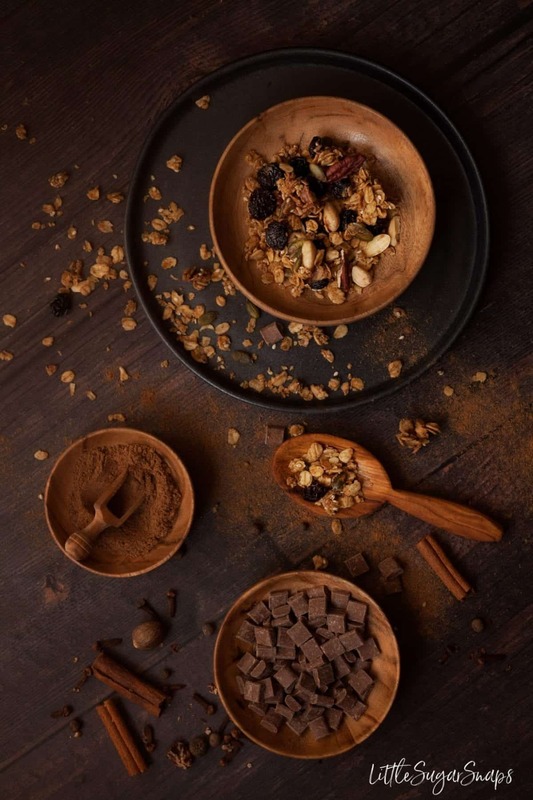 Spices, nuts, chocolate, salt and oats combine to create a luxurious and irresistible Chocolate Pumpkin Spice Granola. 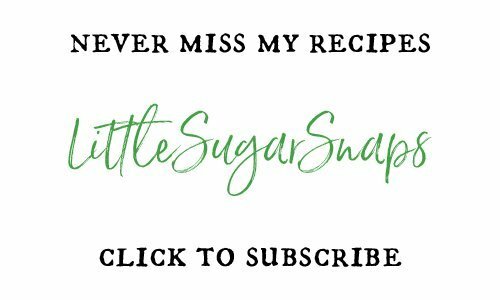 Want my healthiest granola recipe too? Here it is: Spiced Apple Granola with Spelt. 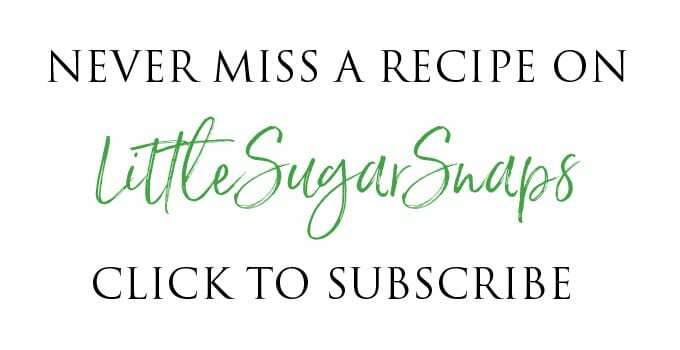 I’m super excited about this recipe! I love a good granola and this one for fall is calling my name. Thanks for sharing this!! 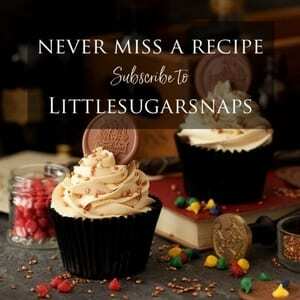 I love the recipe, especially the homemade pumpkin spice! This has been the perfect taste of fall to add to my yogurt and ice cream! Love the flavor! Wholeheartedly approving of the ice cream over here – chocolate or vanilla…..
OH my goodness! This looks amazing! I have this one my shopping list this weekend! Hope you enjoy it as much as we do Kasey.